PM : When was your company founded? EE: I founded Eating Edible in 2011 when our son Lucas left for college. PM: Where are you based out of? EE: We are based in Hartsdale, in Westchester County just north of New York City, but we ship to anywhere in the United States. PM: How many are involved in the company? EE: Eating Edible is a woman-owned family-run business, which means five of us do everything. Our daughter, Aliza, is in charge of event planning and community outreach. Our son Lucas, who just graduated from Georgetown, does our computer and website work. Our youngest child, Tyler, who is 16, is our reality checker. He tells us what he thinks! My husband does outreach to schools – and then there’s me who does everything from packing care packages to ordering foods to answering emails and phone calls. I do everything that someone else isn’t doing that needs to get done. PM: What inspired you to start the company? EE: Necessity! They say that necessity is the mother of invention – in this case that sums it up! Fourteen years ago, our son Lucas was diagnosed with multiple food allergies as well as other allergies. The toxins caused him brain allergies known as neuro-toxic brain dysfunction. He was diagnosed in second grade by an amazing doctor. These allergies left him unable to enjoy foods produced for the general population. When he went to summer camp, they had no foods for kids with allergies, like him. Everything he ate had to come from home. At college, the problem was exponentially worse. Freshman year, where other students experience the famous freshman 15+, Lucas had the freshman -15 to 20 lbs. No one was offering easily accessible wheat-free cookies or gluten-free desserts, much less egg-free and dairy-free too. So now we do! p.s. Back in second grade, I would have re-built ancient Rome to give Lucas a normal life. He was smart but mentally absent way too much of the time. I thank a doctor named Dr. Wojcik for his unbelievable help. Who would have known that by removing these food allergy toxins and giving him the necessary allergy medications, Lucas would go on to graduate from high school top of his class, and then go on to Georgetown, graduating in 2015?!! PM: Did you have a background in business prior to starting the company? EE: I have always been an entrepreneur. I was raised that way and always believed all things are possible. My father had his own business; but, no, I did not have a background in nutrition or allergies. I did, however, know my child and what we had been through, trying to navigate our way. The question to ask when starting a business is, “Do you personally need this?” The answer in our case was and is unequivocally “yes”, and I want to share what I have learned with others. PM: Did you run into any problems or resistance while launching your company? EE: Our biggest problem has been getting colleges and universities to understand that we fill a unique need that their contracted third-party providers do not meet. They do not offer care packages that our kids can ingest. Maybe they offer a gluten-free or peanut-free package but they do not have ones that can be ingested by people with other allergies or more than one dietary restriction. We can use all the help we can get to educate schools to understand: 1.) that kids with allergies are made to feel like outsiders and freaks when they can’t participate in meals, parties and other social gatherings; and 2.) that by allowing us to offer our care packages on their campuses, kids with dietary restrictions can be included. 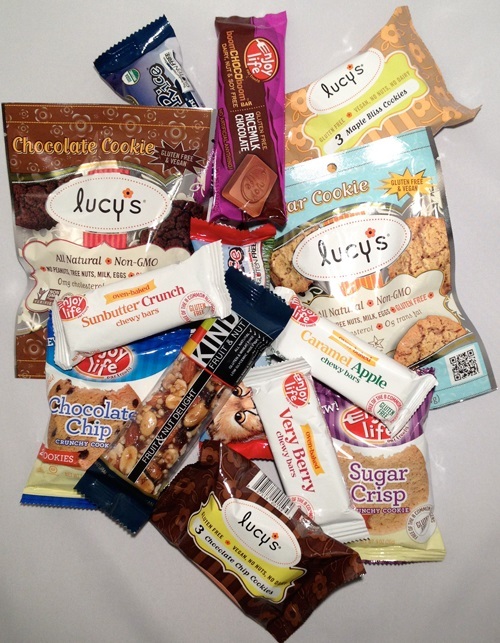 All of our treats are packaged by the producer with the ingredients are clearly listed. PM: What is the most exciting part of running your own business? EE: Making people happy! I know that sounds way too simple but this has been one of the most amazing experiences in my life. Wherever I go and share information about Eating Edible, people welcome us with open arms. The need for our care packages is unquestionable. Outside of major metropolitan areas, the delicious celiac and allergy-friendly items we put in our packages are not available – and people don’t have a million dollars to spend on the web testing different food items to see what is good. We offer a mix of allergy-friendly foods for a reasonable price! We also happily custom-prepare packages for other special dietary needs! I love it. EE: We hope to expand the public consciousness and our business. We want to increase the public’s awareness of celiac and food allergies, and their many behavioral manifestations. Too often celiac disease, allergies to foods including nuts, peanuts, eggs, fish, and dairy are considered unusual. They aren’t. Business-wise, we want to share our knowledge. We are already making goodie bags for birthdays and weddings. We want to expand on that and make all celebratory experiences great for all people, regardless of dietary restrictions. I’ve ordered from Eating Edible twice (last summer and this summer) to send care packages to my son at camp. The owner was amazing with her customer service and my many questions. My kid was thrilled to get a package and not have to pick through what was in it to get to the stuff he could have. I don’t have to send care packages often (obviously), but they are my go-to when I do need to send them.